During the run-up to the Commonwealth Games in Delhi an article in the sports section of the Guardian suggested a reluctance on the part of some athletes to compete, amid rumours of unfinished accommodation in the competitors’ village. The writer compared this attitude with the “heroic – albeit borderline delusional – gumption” of the hazardous travel arrangements of one former Commonwealth athlete, the Australian javelin thrower, Reg Spiers. Spiers’ story is well known among colleagues from the athletics world. His name, apt for a javelin thrower, is synonymous with the kind of youthful daredevilry rarely associated with track and field athletes. Former discus thrower turned television crime writer Arthur McKenzie well remembers swapping anecdotes about the athlete he now refers to as a “folk legend”. A recent feature in the Daily Telegraph claims that Reg Spiers “deserves his memorial in print”. It refers to the first book to chronicle the off-field enterprises of the Aussie thrower as a story “unlikely ever to be matched”. The young Spiers was tall and solidly built with a powerful throwing arm. His second placing in the javelin in the 1961-62 Australian National Track and Field Championships earned him a place in the 1962 Commonwealth Games squad in Perth, where he placed fifth. 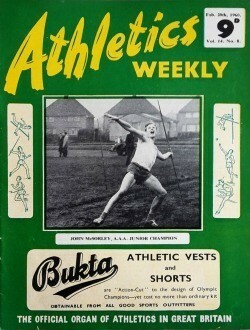 During the competition he met and befriended the then British javelin champion and record-holder, John McSorley – pictured on AW‘s cover in February 1960, right. The pair kept in touch but their paths didn’t cross again until 1964, when Reg arrived, unannounced, at John’s flat in Twickenham. Known as ‘Reggie’ to his friends, he was a larger-than-life young “Aussie larrikin” who had worked his passage to the UK on an oil tanker in time for the British athletics season. When his ship docked in Newcastle-upon-Tyne he sold his razor to a shipyard worker in order to buy a train ticket to London. Having failed to qualify for the upcoming Tokyo Olympics at his hometown club in Adelaide, he was hoping to have the opportunity to plant one big throw, have it officially ratified, and impress the selectors back home. Nothing went to plan. He trained tirelessly with McSorley at St Mary’s College in Twickenham, regularly passing himself off as a student. The organisers of the AAA Championships allowed him to compete as a guest, but both athletes had injuries and throwing below their best distances. McSorley found him a job at Heathrow airport, but Spiers lost all his money when his wallet was stolen. He finally conceded that his Olympic quest might be over. By now he was penniless and desperate to get back to Australia. By all accounts he wasn’t the type who was prepared to wait and so in late summer 1964 he hatched a most outrageous plan to post himself home. Preparations were made at various locations in Twickenham, where McSorley built a man-sized wooden crate for his friend’s journey. The box measured 5ft x 3ft x 2ft 6in, only affording enough room for the unfortunate occupant to sit with his legs straight, or lie flat with them bent. On October 17 Spiers embarked on what has become a legendary journey. Boxed as airfreight described as “rubberised emulsion”, he was delivered to the freight department at Heathrow. Duly labelled ‘handle with care,’ Spiers was consigned to a non-existent shoe factory in Perth, cash on delivery, and designated for collection at the other end by a fictitious company representative. The young javelin thrower endured a gruelling 13,000 mile, 63-hour flight, fraught with delays, forklift trucks, and near-dehydration on the tarmac at Bombay Airport. And so at the exact moment Lynn Davies was receiving his long jump gold medal at the 1964 Tokyo Olympics, an Australian javelin thrower of the same age had lost his Olympic dream and was heading home. Spiers was making a different kind of history, rattling around his box in the cargo hold of a Boeing 707. One week after his departure John was starting to worry because he still had no news and feared his friend might have perished in some far-flung warehouse. He contacted a friend, James Coote, sports correspondent at the Daily Telegraph in London, who phoned his counterpart in Sydney and tracked down Spiers at his home in Adelaide, and the story became front-page news. Reg’s notoriety spread through the international press and he was inundated with interviews and advertising opportunities. 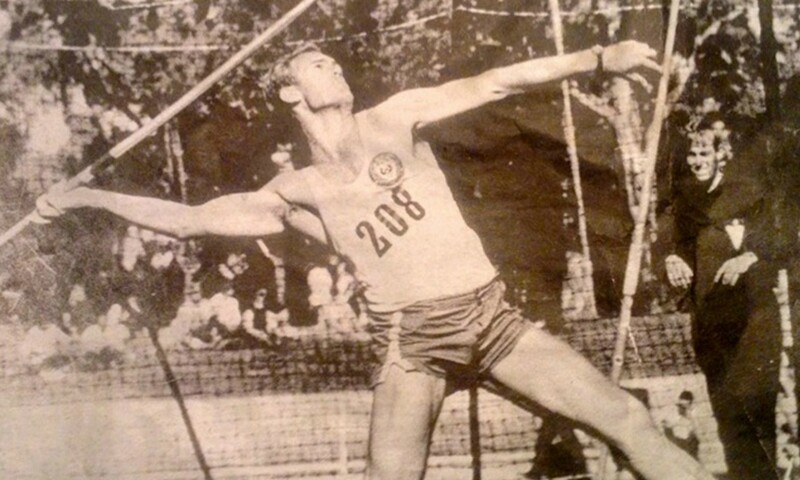 Trouble eluded him for more than a decade and he continued throwing the javelin, winning the 1966-67 and 1976-77 Australian Championships and competing in the US versus the Commonwealth match in Los Angeles. He retired from athletics in 1979 and, had he been prepared to leave his smuggling enterprises well alone and settle for a quieter life, we might never have heard of him again. He didn’t – his box escapade was followed by several more illegal journeys over the ensuing years. Hotly pursued by the Australian Federal Police and Interpol, Spiers skipped bail in 1981 and embarked on a wild road trip with his girlfriend across India, Africa and Sri Lanka. As the title of the book suggests, Spiers’ life has been a series of highs and lows. Without doubt, the biggest low was when he was caught with narcotics at Colombo Airport and sentenced to death. Ever the joker, as Reg was led from the courtroom, arms shackled, he told a journalist that his dire predicament was his own fault – for taking a flight in the regular passenger compartment.